With Thanksgiving a couple of weeks behind us and Christmas fast approaching, my mind is in super planning mode and super baking mode. Which makes life a little difficult since we are in the midst of our 24-Day Challenge, and sugary treats are not on the approved foods list. I took a hefty batch of Christmas goodies to work today. Three different kinds of biscotti. And I ate none of them. That’s some will power, y’all. Instead I am focusing on cooking healthy meals and looking forward to finishing the challenge strong and being able to indulge a little bit once Christmas is here. As of Sunday night, J has now brought home 3 deer this season so far. Our freezer is plenty full and I am once again rounding up recipes that I can use to make the most of our haul. I found this recipe awhile back and couldn’t wait to make it. And, you guys…holy moly. 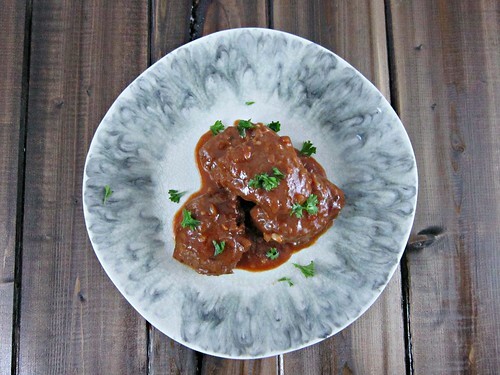 The sauce for this recipe is one of the most amazing sauces you will ever taste. No joke. J loves it and we are ready to put it back on the menu. Repeats aren’t that prevalent for us since I’m always trying or coming up with new recipes, so for something to be so good that we both want it again right away, that means it’s something pretty spectacular. 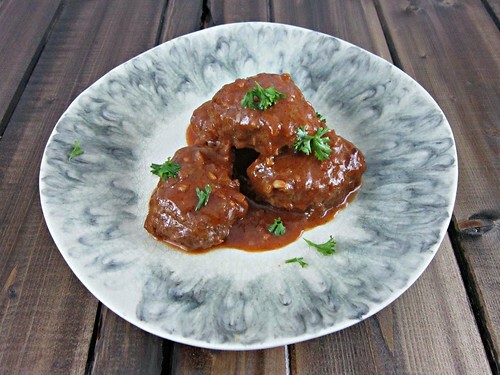 I don’t even know how to describe the sauce…the mustard, Worcestershire sauce, tomato paste, and coconut milk all come together, with the beef broth to form a rich, creamy, and slightly tangy sauce that will punch you in the mouth. In a good way. If you have a freezer full of venison, or someone has gifted you a nice piece of backstrap, you must try this recipe. MUST. And for those of you who are not venison eaters, you could also use beef or lamb loin. Season venison medallions with salt and pepper and set aside. Heat the butter in a large saute pan over medium-high heat for about 90 seconds, or until melted. Add the venison, in a single layer, and cook for 3-4 minutes per side, or until nicely browned and cooked to your desired doneness. Remove the venison to a plate and keep warm. Add the shallots to the saute pan and cook for 1 minute, until slightly softened, then add the garlic and cook for another 30 seconds. Add the brandy (or Amaretto…) and deglaze the pan, scraping up any browned bits in the pan with a wooden spoon. Let the brandy cook down almost to a glaze, then add the stock, tomato paste, mustard and Worcestershire sauce and stir to combine. Cook on high heat until thickened enough that if you drag a wooden spoon across the pan it leaves a trail behind that doesn’t fill in for a second or two, about 3 minutes. Turn off the heat and let the boiling subside. Stir in the coconut milk until the sauce is as light as you like. Add the venison medallions into the sauce and turn to coat. Serve with parsley as a garnish, if desired.